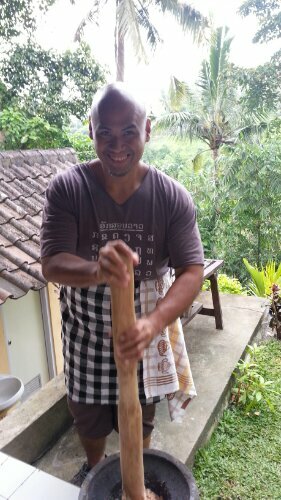 Since my first cooking class at Tamnak Lao in Luang Prabang December last year, I’ve made it a point to join a class whenever I travel. It’s a wonderful way of learning the complexity of the cuisine I like so much with the added bonus of being able to re-create the food back home. Actually seeing it being made, seeing how it looks, smelling the aroma, feeling the heat as it simmers, makes the recipe come to life. I’ve always loved Indonesian food with its fiery spices that tantalize the taste buds and boggle the mind. Where did that flavor come from? How could they have cooked it this way? My goal in this class was to learn how to make satay, peanut sauce, and nasi goreng. 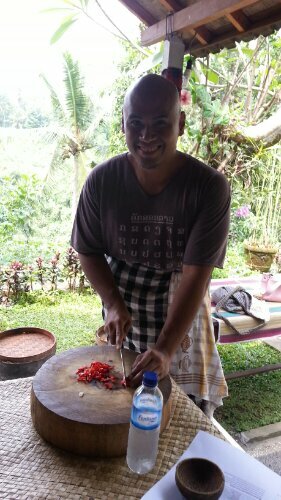 With so many cooking classes in Ubud, it was hard to choose. I finally settled on Payuk Bali because of the menu though it didn’t feature nasi goreng. Ketut, the chef, picked me up a little past 8 in the morning. In the van were a young couple from Melbourne, Rick and Madelaine. We then fetched, another guest, Zuri from the US but based in South Africa. Ketut explained that there were 8 of us but we had been divided in 2 groups. 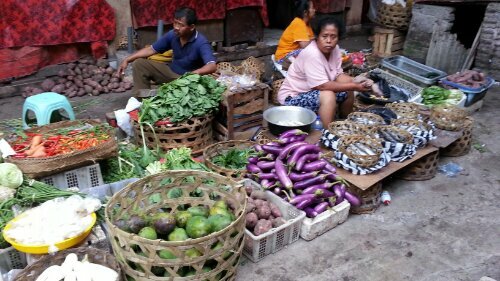 First stop was Ubud Market. This was the same market that tourists go to for souvenir shopping. At past 8 in the morning, it looked different as most if the shops were still closed. 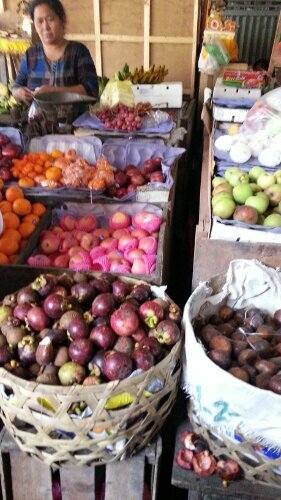 Instead, there were all sorts of fruits, vegetables, spices, fish, and other stuff a cook would need. 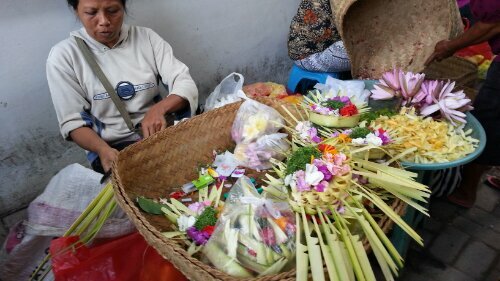 Lontar leaves and flowers for the canang were also in abundance. 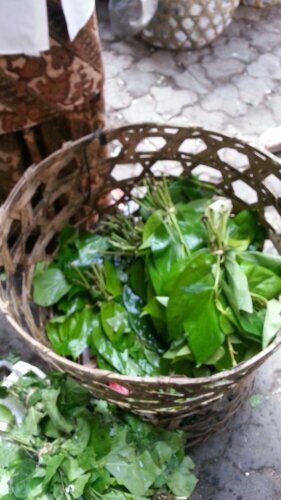 Of course, what would a traditional Southeast Asian market be without betel leaves? Lots of unidentifiable food for sale. 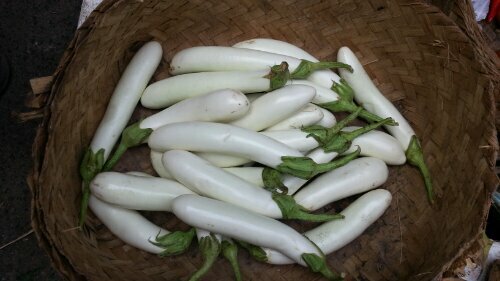 But the most interesting find, at least for me, was the white eggplants! They were such a shiny white. 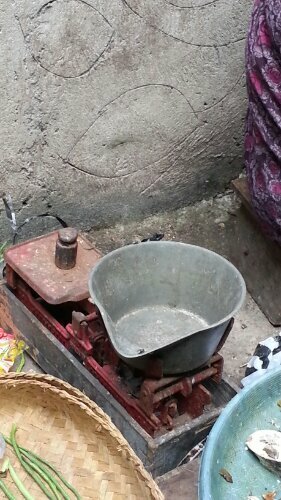 The weighing scale was also interesting. From the market, we headed outside Ubud to some rice fields where Ketut explained the Balinese irrigation system called siobak wherein the entire village shares in the irrigation, channeling water where it is needed most. One important lesson I learned is: rice stalks that bend over and touch the ground are no good. 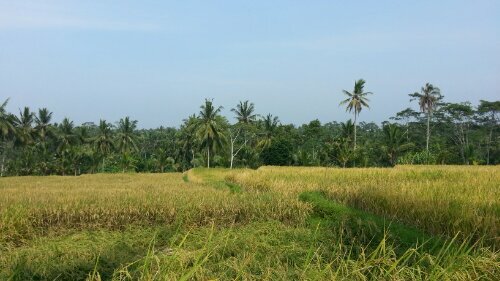 Ketut also explained that since the fields had black soil due to its proximity to Kintamani, it was very good for growing white rice. Brown rice was rhe domain of Jatiluwih which is towards the west. 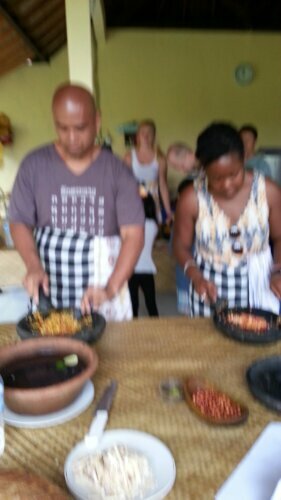 We then headed to Laplapan village where the cooking school was. The school was inside a family compound and Ketut explained how itveas organized. The eldest son’s bungalow faced north while the parents faced west. The kitchen was south. We were then led to an area used for ceremonies where we were taught to make the simplest canang, those square offerings placed everywhere. According to Ketut, a person needs about 50 of those per day to place everywhere. That’s a lot. 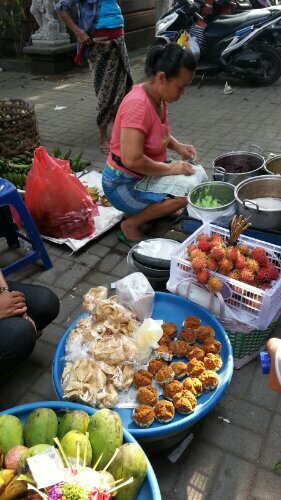 No wonder one always sees someone, usually a female, making canang. It was simple really. You take a strip of leaf and form it into a square using thin wooden splinters to secure the ends. Then a square piece is placed at the bottom and secured. A dried betel leaf is placed along with multi-colored flower petals. Finally, curly hair-like threads of the pandan leaf are placed. After making the offerings, cooled with a refreshing glass of lemongrass tea sweetened with honey, we were lef to a small shed where we watched an old woman make coconut oil over a clay wood-fired stove. A large pot was already simmering and a sheen of oil had already formed on top of the coconut milk. Then it was on to the cooking school at the back of the compound overlooking a gorge lush with greenery. One side was the cooking area and another side was the dining area. We had some jackfruit fritters and tea while the staff prepared the kitchen. The other group arrived a few minutes after we had settled down. They were under another chef’s care. 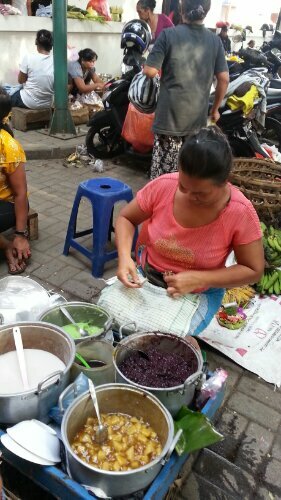 Our menu: basic paste used for everything, gado gado, sate lilit, Bumbu ayam, nasi kuning, and sweet potato in palm sugar. We were each assigned a chopping board and were given stuff to chop. We all shared preparing or cooking the different food rather than creating each of the dishes from scratch. I was disappointed as I didn’t really feel like I was cooking. 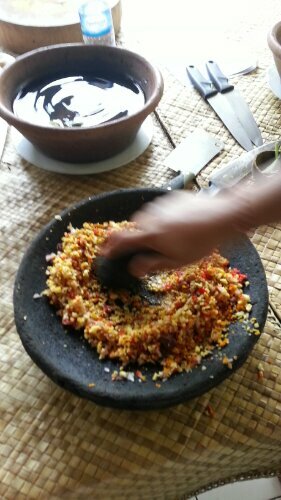 The vegetables had been pre-cut already and we merely chopped it and mixed it all up in a stone mortar for the sauces. Chicken for the sate lililit was mashed in a large mortar and pestle and anyone who was interested did a few pounding. One person would be cooking something and Ketut would tell someone to put a teaspoon of this and a tablespoon of that while the rest watched. One common thing we all did was to put the mashed chicken which had been mixed with the basic sauce in bamboo sticks for the sate lilit. The saving grace was Ketut’s and the staff’s friendliness and casual banter with us. It was soon over and we headed to the dining area where the staff prepared the food we had cooked buffet style. There was a lot of food and a few of us took second servings. The spices and the chili had of course been scaled down which made it a little boring. I liked the Bumbu ayam the best. I did enjoy the class mostly because made it fun and I did get to see how the dishes were all made and with the recipes and all my mental notes, I’m confident I could recreate all those back home. However, I left the cooking school a bit frustrated as I wish I could have experienced some more.